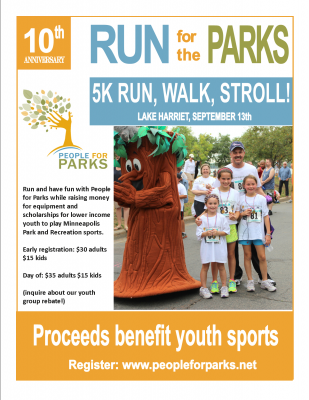 Join us at Lake Harriet on September 13th for the People for Parks’ 10th anniversary Run for the Parks; 5K Run Walk or Stroll. All proceeds benefit youth sports programs! You can run, walk, or jog – bring a friend, bring your kids or bring your pet! We let the serious runners run up front and there’s a giant digital clock so they can time themselves. This is a great family friendly that gives back the parks we so dearly love. Nearest Parking: Parking will be most available west of the lake in the Linden Hills neighborhood.